An important part of improving on the piano is carefully listening to your playing to understand how your expressions influence the sound. But if your instrument isn’t capable of faithfully reproducing them, it’s impossible to properly evaluate your progress. The Roland HP601’s SuperNATURAL Piano engine with 288-note polyphony delivers the rich, expressive tone of an acoustic grand piano in every way, with complex, dynamic sound that tonally changes in response to the way you play. 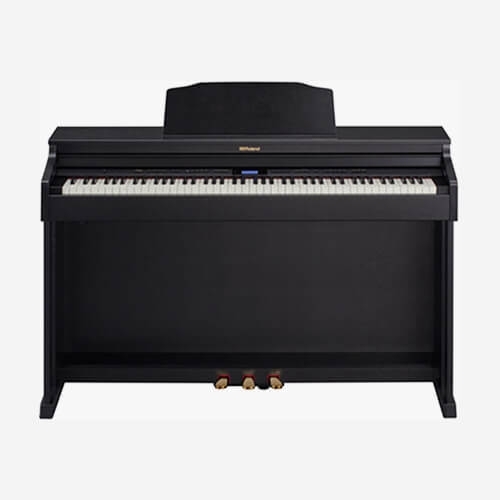 This enables you to fully recognize and develop the vital interaction between sound and touch, which is at the very heart of playing the piano at a higher level. Equipped with Roland’s flagship PHA-50 keyboard, the Roland HP601 further supports the important sound/touch interaction with ultra-responsive sensing that translates every subtle playing nuance. 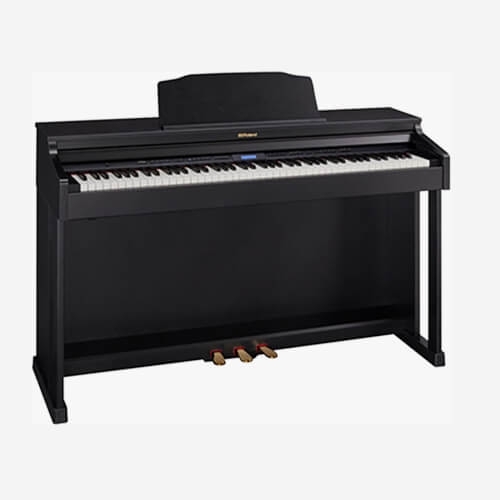 The keyboard combines wood sides with durable molded materials, providing a traditional grand piano look and the feel of ebony and ivory with no worries about costly reliability issues down the road. The HP601 also includes three integrated pedals that support progressive and half-pedal control. This capability is required to play more advanced piano pieces, and is not available on instruments that employ less sophisticated pedal switches. With the HP601’s onboard Bluetooth technology, you can wirelessly connect with your iOS or Android device for instant enjoyment and enhanced learning. To start, you’re able to play along with your favorite songs in your smartphone or tablet as the audio streams through the piano’s onboard speakers or headphones. Roland’s unique Piano Partner 2 app takes things even further by augmenting and enhancing the Roland HP601’s many onboard features. It shows digital notation for the piano’s internal songs, and you can even turn pages with the pedals. There’s also a variety of fun backing rhythms, letting you build your timing with pop, jazz, blues, and other music styles. And with the app’s cool diary feature, you’re able to track your practice progress with stat logs and daily notes. As your piano skills evolve, your personal sound tastes will too. 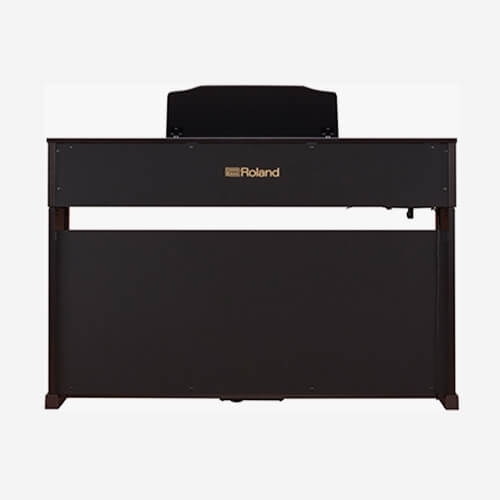 With the Roland HP601, you have a variety of options to customize the piano for your individual style and touch. The powerful Piano Designer function allows you to personalize grand piano tones by adjusting the various tonal elements that affect the sound, including string resonance, the resonance characteristics produced when using the pedals, and more. It’s even possible to fine-tune each note by separately adjusting tuning, volume, and tone character for all 88 keys. The HP601 is also compatible with the free Piano Designer app, which allows you to use your tablet device to make customization even easier. With its modern digital approach, the Roland HP601 eliminates all the downsides of owning an acoustic piano. First and foremost, the advanced sound engine never needs tuning or other regular maintenance, saving you lots of time and money. Another prime advantage is the ability to play quietly with headphones. The innovative Headphones 3D Ambience technology in the HP601 optimizes the audio so it sounds like it’s coming from within the piano itself, enabling you to practice for extended periods of time without fatigue, day or night. If you already have an acoustic piano, the HP601 is an ideal second instrument to place in a spare room for night practice. And with a choice of Contemporary Rosewood, Contemporary Black, and White finishes, you can perfectly match the instrument to suit your home’s décor.